To celebrate the release of Paris Love Match by Nigel Blackwell, we have an excerpt from the book and an ebook giveaway! Getting a taxi in Paris can be hell. Piers Chapman expected a boring business trip to Paris. What he didn't expect was to fight over a cab with a beautiful girl. After a bad meeting, Sidney Roux just wanted to hail a cab, go home, and have a glass of wine. She didn't expect to fight over a cab with some pompous British tourist. Neither of them expected another man to jump in their cab. Or to be involved in a gun fight. Or a car chase through the streets of Paris. Or for the man to die. But they're thrust together when the mob demands they return what the dead man stole. Will Piers and Sidney work together? Will they find what he had stolen? And will they do the last thing they expected? Will they fall in love? Paris Love Match was released by Bandit Publishing on 2nd May and is available at Amazon UK, Amazon.com & Barnes and Noble. Around the corner shouts broke out among the police officers. With a squeal of tires, a string of police cars headed in their direction. Piers grabbed her hand, ready to run. She pulled him back, shoved him against the wall, and pressed herself hard against him. She popped open the umbrella and flipped it over her shoulder, blocking them from view, then pressed her face into his neck. He folded his arms around her and stroked her back. Her breath was warm on his neck. He tilted his head to press his face to hers. He could feel her bra and the softness of her body pushing against him. She ran her hands over his shoulders and down his arms, squeezing his biceps playfully. The tension in his limbs dissolved and a warm glow spread through him. A calm smile spread across his face. She rubbed her hand across his shoulders and her long hair brushed against his ear. He closed his eyes and squeezed her tight. “You only have to act like you’re enjoying it,” she said. Sidney slid from him. He let his arms fall away slowly. He breathed out, stifling a sigh, and didn’t breathe back in. Her leaving him felt like a physical blow. It took all his willpower not to reach out for her. The rain had made her tousled curls a vague memory, but her eyes were bright and, even in the cold, her high cheekbones had a natural tint to them, the slightest of pinks, just enough to accentuate the flawless white of her skin. Nigel Blackwell was born in rural Oxfordshire in England. He has a love of books, a PhD in Physical Chemistry, and a black belt in pointing out the obvious. As a teenager he toured Europe and loved seeing the wonders of the world and the people in it. Since then he has been fortunate enough to travel across Europe, North America, the Middle East, and Japan, and hasn't been anywhere that doesn't have the potential for a story. He now lives in Texas with his wife and daughter, where they enjoy the sunshine and listen to the coyotes howl at night. 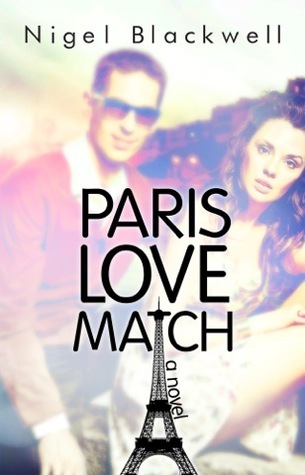 Want to win an ecopy of Paris Love Match by Nigel Blackwell? Books will be gifted from Amazon or Barnes and Noble from AToMR Tours. The Winner will be announced Tuesday 7th May and will have until Sunday 12th May to contact us & tell us if they want it gifted from Barnes and Noble or Amazon.